CMOs and business owners are always asking to validate not only the effectiveness of social media, but also the necessity of having a social media strategy. This week I wanted to highlight an unlikely social media channel and how it has been able to target and grow its engagement amongst its key audience. Enter Scotiabank. Its recent success with their social media strategy using Instagram has helped them specifically target university-aged students 18-24, an audience often touted as the most difficult demographic to engage. Instagram is often thought of as the photosharing app used for family and friends only, but things are changing for business applications as Instagram now boasts 15 times more engagement than Facebook, Twitter or Google+. What was once a simple photosharing app is now being used as a key sales channel. In the world of social media, Instagram is relatively new and as an emerging channel, it enjoys the same cache with younger Canadians that Facebook enjoyed several years ago. With this in mind, Scotiabank, in a strategic yet bold move, launched its Instagram channel in 2013 and has garnered 897 followers to date and is still growing. The channel is unique in that is allows for the ability to tailor content to any kind of youth-oriented theme. The decision to use this channel was based on the need to use a relevant and extremely flexible platform to reach their target audience. Scotiabank feels their decision really gives them a lot of opportunity in terms of their messaging and making their brand unique by being on the forefront of providing content in a medium that is relevant to them. 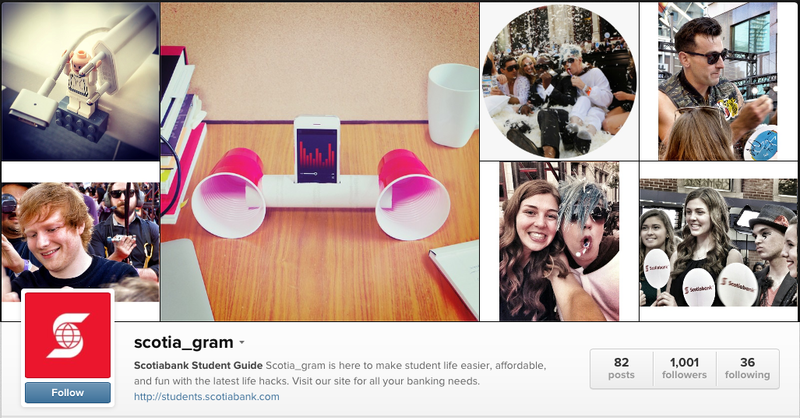 The ultimate flexibility of this channel allowed Scotiabank’s Instagram channel “Scotia_gram”, to introduce a series of “life hacks” for students headed back to school. They included tips such as storing necklaces in straws to avoid tangling, and using an old cardboard box to create a shirt folder. As a result, “likes” for Scotia_gram’s posts have increased just over 99%, and comments have jumped 22.3% since the “life hacks” were first introduced. The account has also gained just under 300 new followers in the same period. This case study is a great example of how sometimes we need to think a little bit “outside the box” in terms of choosing channels to deliver our strategy to specifically target our audience. After reading this case study would you consider using Instagram for your business, and if so, how? Do you feel Scotiabank is on to something here, or would another social media channel have been equally successful for their strategy? ← A Strategy for a Blog? Really?